That’s what my parents told me day after day referring to toys, bikes and sporting equipment I left on the grass in our front yard. I recall a football or Frisbee going missing but nothing major like a bike. And now I find myself saying the same phrase to my children who listen as well as I did to my parents. The kids were able to spend a few hours of bike riding during the few times the sun came out this week. When I returned from church, I looked out the window to see this kid’s chair sitting on the grass. Most everything else made it into the garage. And now huge snowflakes are falling from the sky. It looks like the heavens are releasing tiny pillows of cotton down on our city. 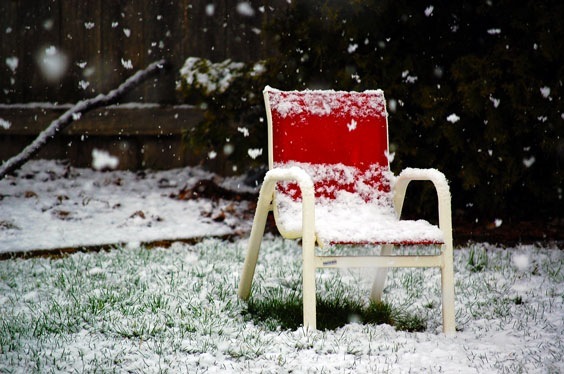 And this little red chair looks so peaceful that I’m thankful my kids left it on the grass. Spring can wait a few more weeks.